Close to 200 Spurs Sports & Entertainment staff members visited the City of Port Aransas last week on Thursday, April 5th which was declared Spurs Day in their honor. The Spurs group spent their day throughout the town to participate in service projects from destruction brought by Hurricane Harvey. The University of Texas Marine Science Institute was lucky enough to get close to 50 volunteers. 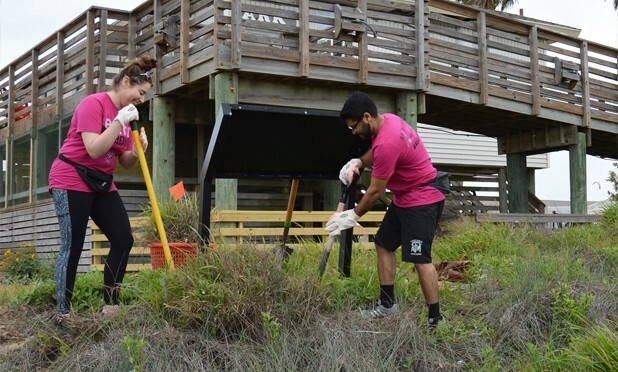 This dedicated crew lent their hands and muscles to pull, chop, and saw invasive pepper trees and guinea grass in our Wetlands Education Center and helped clean the Amos Rehabilitation Keep.